This recipe for Small-batch Chocolate Chocolate Chip Muffins makes four big beautiful chocolate muffins stuffed full of melty chocolate chips. Preheat your oven to 425°F and line your cupcake pan with 4 liners. In a medium bowl, whisk together sugar, sour cream OR yogurt, egg white, coffee OR milk, vegetable oil, and vanilla extract until smooth. Stir in dry ingredients until just combined. 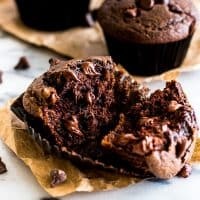 Fold in chocolate chips and dived batter between your prepared cupcake cups, filling them 80% of the way full (this should use all to almost all of your batter). For extra pretty muffins, drop a couple chocolate chips over the tops of the batter before they go into the oven. Bake for 8 minutes, turn the temperature down to 350°F and continue to bake for an additional 6 to 9 minutes. Muffins are done when a toothpick inserted into the center of the muffins comes out with just a few dry crumbs. Cool in the tin for 5 minutes before transferring to a cooling rack. Serve warm and enjoy or cool completely and store in an air-tight container for up to 2 days. *These muffins are great whether you use sour cream or yogurt, but sour cream will give you a prettier, bigger muffin top (the muffins in the pictures for this post were made with sour cream). So if that matters to you, keep that in mind! Approximate nutritional information is for muffins made with sour cream.